When our Torah speaks about the Festival of Sukkos it states, “Chag HaSukkos Taaseh Lecha B’Aspecha Migornecha U’Miyikvecha.”1 “The Sukkos holiday should be observed at the time that you harvest your grain and your wine,” during the fall. Our Chachamim, sages, have taught us that this pasuk has another esoteric meaning. The sukkah, in which we dwell during this chag, should be made from the unused parts of the harvesting grain and wine, namely the stalks of grain and twigs of the vine. These are the items that should be used for the schach, the covering, which is placed on top of the sukkah instead of a permanent roof. Our Rabbis have further taught that this directive, pesoles goren v’yekev, includes other items that are similar to stalks and twigs that are no longer attached to the ground and cannot become ritually impure, tamei. Unfinished wood slats, corn stalks, and palm branches are popular varieties that satisfy the criteria for schach. Many natural materials are not qualified to be used for schach. Leather is a natural product that does not grow from the ground; neither do cement nor natural materials such as metal. None of these may be used for schach. All types of foods are not kosher material for schach. Included in this halachah are grain husks that have some grains remaining in the husks. Wood products that are cut and shaped into vessels, utensils, or equipment that is tubular, would not qualify as schach because these products can become tamei. Furthermore, even if the wood vessels were to be broken and unfit for their original use, and can no longer become tamei, they remain disqualified. Although hollow, bent wooden pipes would not be kosher for schach, hollow bamboo poles would be kosher because they grow hollow naturally, and were not fashioned by anyone with the intention of putting things into their opening. Similarly, straight wooden pipes without indentations would be kosher, as well as wooden beams, even those with imperfections in the wood. However, the custom is not to use them. Stems that are used for schach must be in their original state and cannot be subject to further processing. For example, wood is kosher while paper is not. Flax stems are kosher but flax rope is not. Cotton wool, which has been combed out and no longer resembles the natural cotton plant, would no longer qualify as schach. Flax rope is problematic for another reason. According to Rashi, if the linen fibers were twisted into threads and braided into rope, they are posul min HaTorah. The Torah disqualifies them as it does any other woven material. Branches of a tree cannot be used for schach if the branches are still connected to their original source. If the branch was still connected to the tree while covering the sukkah and was then cut down, the branch would still be disqualified, unless a person lifted the branch and then replaced it on the sukkah with the intention of using the branch for schach. Our Rabbis have taught us that schach that has an unpleasant odor should preferably not be used. Use of schach that has a pervasive foul smell is forbidden. Kosher schach has to remain fresh throughout the entire chag. Branches with leaves that will dry out during Sukkos, or vines that will shrivel, are disqualified and are not kosher even while the leaves are still fresh. Kosher schach material must be placed on top of the sukkah with the intention of being used for schach. One cannot place kosher schach material on top of the sukkah with the intention of drying the material, and then change his mind in the course of the drying process and use it for schach. To this end, the halachah forbids the use of bundled schach if it is generally subject to drying. Moreover, our Rabbis forbade the use of this bundled kosher schach, even if it was intended for schach. This restriction applies to bundles of 25 sticks or more that are tied in the middle or at both ends. How wide can the boards be in order to qualify as kosher schach? One may use boards that are less than 4 tefachim (14”) wide. Even if wider boards would be set on their sides, these boards would not be kosher. It is the custom not to use narrower finished wood planks generally used in construction. As was stated previously, the criteria for schach is three fold: 1) items that grow from the ground, 2) items that are no longer attached to the ground, and 3) items that cannot become tamei. Reeds, straw, or wooden slats that are woven into mats would not qualify as schach if they were woven for the purpose of sitting or sleeping upon, as well as any other specific function. However, it they were made expressly for schach, these mats would be kosher. A kosher monofilament mat must be placed on the sukkah in the proper manner. The following guidelines must be followed: The bamboo slats should be placed perpendicular to the beams and walls upon which they rest. In other words, if the monofilament line (which does not qualify as schach) is supporting the slats, the mat has been placed down improperly. One may not suspend schach with non-schach material. Furthermore, schach mats must not be anchored with string to prevent the mat from blowing away in a normal wind (a ruach metzuya). For the same reason string, which is an improper schach material, cannot be used for anchoring. Instead, a kosher wooden beam may be placed across the mat in order to hold it down. Can kosher mats contain more than 25 slats, or would the mat be considered a bundle (chavila)? Since the mat does not need to be dried, it may contain more than 25 slats without qualifying as a bundle. There is a rabbinical question as to whether one can support the schach with something that is not kosher for use as schach. Therefore, one should not support the schach with anything that can become tamei, i.e. metal rods or pipes. Also, one cannot use metal to weigh down the schach so that it will not blow off with an ordinary wind. One may, however, hold down the support with something that is not kosher for use as schach. If the schach is supported by wooden beams, which are used to strengthen the schach to prevent it from blowing away in an unusual wind, then nails or string may be used as a support to the beams. How much schach should be used to cover the sukkah? 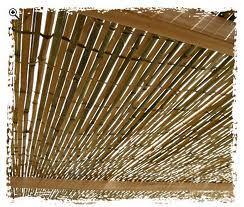 The amount required is determined by the amount necessary to shade the sukkah. The schach must be dense enough so that there should not be more sunlight than shade. However, it cannot be so dense that the rain would not be able to fall into the sukkah.